There are 3 legendary boundary gates at Mungyeong Saejae Provincial Park, on rough mountaintops, which are reputed to be too tall for even birds to fly over. Mungyeongsaejae, which overlays Mt. Joryeongsan, has always been the highest and most dangerous mountain pass. It was cleared during the time of King Taejong (r. 1400-1418) of Joseon Period and was used until a new road was built through the Ihwaryeong Gyegok Valley. The boundary gates and castle walls were raised after the Japanese Invasion of Korea (1592 and 1598). 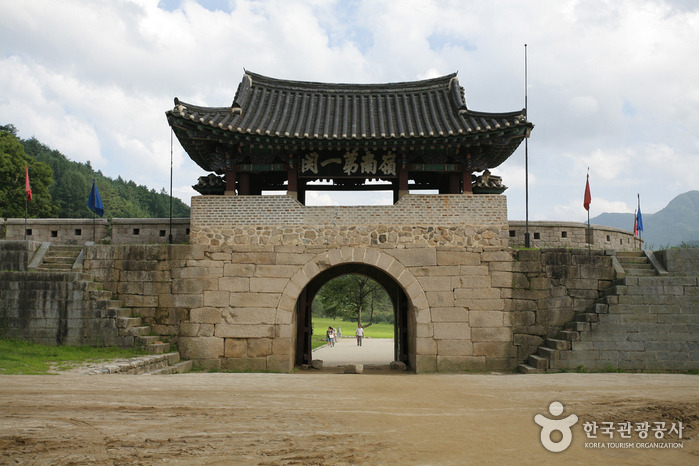 The second boundary gate, Jogokgwan, was raised in 1594, and in 1708 Juheulgwan and Joryeonggwan were raised and used as fortresses for national defense. They were damaged after that point, but in 1966 the No. 1, 2, and 3 boundary gates and castle walls were designated collectively as historical relic No. 147 and were later restored in 1976. Take the big road beside boundary gate No. 1 of southeastern Korea, Juheulgwan, for about 1.5km and you’ll arrive at Joryeongwon. There are only stone walls left from the many inn-like dwellings, which were built to accommodate government officials on an official tour. Past the tavern, which was restored in 1983, you’ll reach the Jogokgwan. The area around Jogokgwan is famous for its birch trees, and the Mungyeongsaejae Revolt Monument can be seen on the left side of the road. 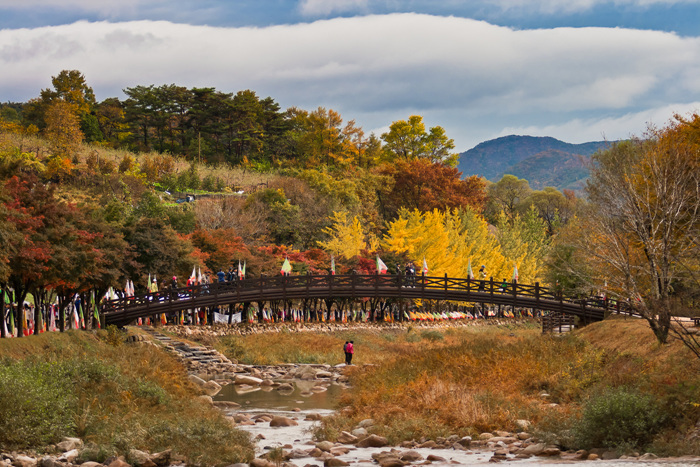 It’s 3.4km from Jogokgwan to Joryeonggwan, through a walkway with its harmonious scenery of rocks and cool streams. Instead of taking the big road, you can take the road with the sounds of stream water, to a waterfall. 30 minutes further and you’ll arrive at Hyeguksa Temple. Hyeguksa Temple is at the edge of Juheulsan, and is the place where King Gongmin (reign 1351~1374) stayed while avoiding the peasant uprising. 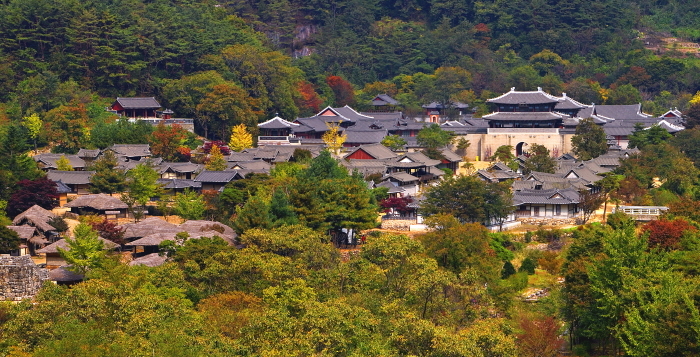 Past Hyeguksa Temple and the Royal Palace about 1km, you’ll reach the sacred peak of Mt, Juheulsan. The view of the winding mountain ranges from the mountaintop is spectacular. From the mountain top, past the valley, is Jogokgwan. The 3rd boundary gate is at Juheulsan (1,106m), and it takes about 4~5 hours to get to Jogokgwan from Juheulgwan. The area was designated as a Provincial Park in 1981. KBS drama studio is located in Mungyeongsaejae Provincial Park, specializing in historical dramas, and it is the largest scale studio in the world. There are three palaces and many houses from the Goryeo Period, spread over 60,000 m2.